LEARN HOW TO COMBAT HIVES WITH HYPNOSIS!!! Itchy, red hives are a natural response for some people. Scientists and doctors are not sure why some people get them and others don’t but they know there are stimuli which trigger the response. 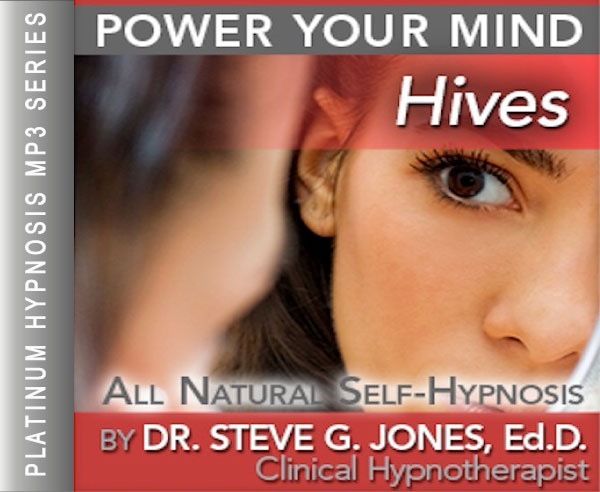 This Relieve Hives Hypnosis MP3 is effective in countering those triggers and relieving the symptoms through eliminating the mental stress triggers common to most breakouts. Some of the general categories or types of factors that cause hives are diseases or infections. There are also several types of physical stimuli. This could be exercise, heat, water, exposure to cold, etc. Coming into contact with certain allergens can create hives for that turn the skin into a field of red, itchy bumps. This might be touching animals, using perfume or cosmetics, working with harsh cleaning agents, etc. The Relieve Hives Hypnosis MP3 audio is helpful in these cases by minimizing the outbreak. Where hypnosis is most effective is in treating the kind of hives that develop from emotional stress. More than one bride has frantically tried to conceal hives due to the stress of planning a wedding and walking down the isle. Likewise, facing an embarrassing situation, anticipating a job interview, or stressing over the holidays can all cause hives to develop. Hypnosis works to reduce the stress and thereby reduce the outbreak of hives. The skin reaction in this case is simply due to a change in hormones and other physical reactions brought on by fears or other emotions. Hypnosis can keep you level-headed and calm so that the body does not go into its panic mode and cause hives to appear. By using hypnosis each night for about 3 weeks you will then have the skills to manage stress in a new way. Steve G. Jones, Ed.D., Clinical Hypnotherapist, charges $1,500 for a custom recording and $25,000 for a one-hour private hypnotherapy session at his office. But you can get all the benefits for this low price. Simply listen to the Relieve Hives Hypnosis MP3 download every night as you go to bed for three weeks and feel the changes happening in your life. You will feel more empowered, more in touch with your true self, and you will truly know that your goals are within your reach. Steve G. Jones achieves AMAZING and LASTING results!!! Hypnosis is the easiest way to affect change in your life because the positive messages go straight to your subconscious mind effortlessly so you can accomplish your goals and reach for the stars!! All you have to do is listen to the Relieve Hives Hypnosis MP3 audio at night as you go to sleep!!! You’ll hear soft music, the gentle sounds of the beach, and the soothing sound of Steve G. Jones’ voice all working together to bring about positive changes in your life easily and naturally. Steve G. Jones has been helping people improve their lives with hypnosis for over 17 years…now it’s time for him to help YOU… don’t wait, do it NOW !!! you’ll be glad you did. See you at the top! And as you continue relaxing deeper and deeper and more deeply relaxed, I would like you to imagine yourself standing in front of a mirror and as you stand there you notice hives on your body. And as you now focus your mind on those hives, see them shrink. See their size diminish over time, that’s right. Perhaps it is a few hours or several days. See them diminish. They reduce in size and your skin color returns to normal and then they disappear completely. In this mirror you can see things happen in fast motion. And as you relax deeper and deeper and more deeply relaxed, I would like you to realize that this process is within your ability. This process of focusing on the hives and eliminating them is within your ability. You are able to do this. And I am now going to train your subconscious mind to be able to eliminate hives from your body. Your subconscious regulates your entire body, your breathing, heart rate, perspiration, hair growth, every part of your body. Every function in your body is regulated by that part of your mind, your subconscious mind, the part that you don’t have to pay attention to in order for it to work. The subconscious mind is very powerful and in charge of so many things in your body, so many processes and your subconscious mind takes care of these processes easily and efficiently and you are in charge of your subconscious mind. Your subconscious mind works for you and you have decided to eliminate hives from your body and to prevent them from returning. Your subconscious mind, since it is in charge of your entire body, it is now given a direct command to eliminate any hives from your body, quickly, easily, naturally, and to prevent their return. Imagine yourself there now in front of that mirror again and you see those hives and you see them diminish in size and you see your skin color return to normal, whatever your normal skin color is that’s the color your skin returns to now as you look in the mirror and you realize that because you are seeing this in fast motion, the actual process may take a few hours or a few days, but you are in charge of the process and so if you ever have hives you focus on them and you imagine them disappearing and your subconscious mind which regulates every part of your body, then acts on that vision and eliminates the hives from your body and prevents their return. So relax now, relax comfortably and understand that everything is going to be just fine because your subconscious mind is very powerful and in charge of your entire body and you are in charge of your subconscious mind. Hives is an outbreak of pale or red bumps on the skin. They are usually caused by an allergic reaction and result in painful itching. This powerful hypnotherapy recording will help you cope with the symptoms of hives and completely eliminate the hives from recurring. Your subconscious mind is in control of the allergic reactions you have. Hypnosis targets the subconscious mind so that you can gain control over your hives. This powerful hypnotherapy program will help regulate the allergic reaction your body has that produces hives. We suggest that you listen to this Relieve Hives Hypnosis MP3 recording for 21 nights in a row to help alleviate hives and to prevent them from coming back. We also suggest that you continue to listen to the hypnosis session on a weekly or monthly basis as a maintenance program to prevent hives. You are capable of great things and you are in control so that you can overcome hives!